Cleveland Browns fans have suffered over the last two years rooting for a team without a win since December 24th, 2016. Bud Light plans to reward fans for their longtime loyalty giving out free beer after the Browns win their first game. 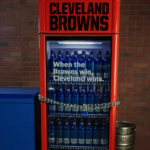 They’ve installed “Victory Fridges” in 10 different locations in the Cleveland area. The fridges will automatically unlock as soon as the Browns win. Atlanta Braves rookie Ronald Acuña Jr. became the youngest player in history to hit a home run in five straight games. In other baseball news, the rivalry between the San Francisco Giants and Los Angeles Dodgers heated up on Tuesday when the Dodgers Yasiel Puig and Giants catcher Nick Hundley engaged in an outburst causing a bench-clearing brawl. Both players were ejected, and the Giants held on to win 2-1.